I flew out to Baltimore, MD (aka Charm City) in mid-July to go exploring and meet up with an old high school friend for a couple of days. The plan was to meet up with her, eat our way around town in the name of research, then meet up with the boyfriend and part ways so that he and I could spend some time with his family in Pennsylvania. After scouring the internet and watching every travel channel show that ever did a special on Maryland, I had a pretty lengthy list of places to try. Amazingly, we crossed the most important ones off the list. The following were the three meals that really left an impression. 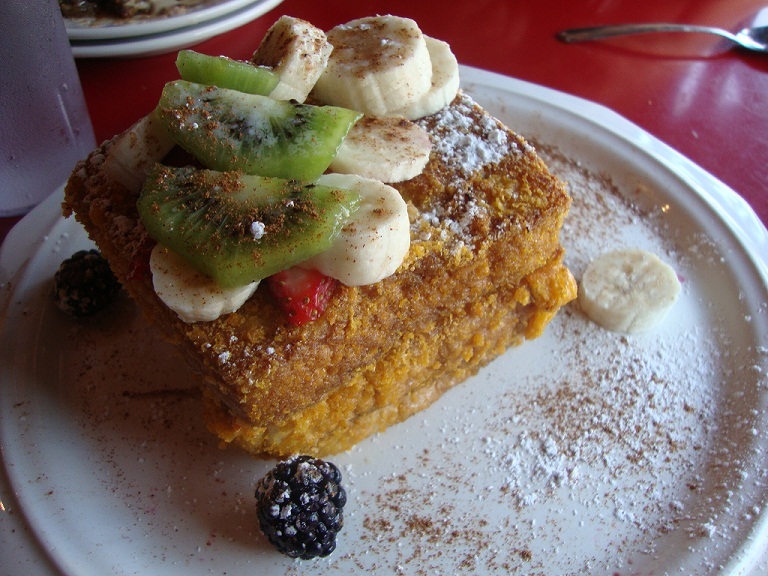 Cap 'n Crunch French Toast, Blue Moon Cafe. Breakfast is said to be the most important part of the day, yet I never eat breakfast. Ever. However, when I first heard about the Blue Moon Cafe in Baltimore’s uber-hip & historic Fell’s Point, I knew I had to make my way over there. I had warned my friend Mor that we’d be going nuts on Charm City and luckily she was definitely a trooper. We got up early (like freaking 7 a.m early) and got to a very sleepy Fell’s Point by 8 a.m. I had read all the online reviews about how packed the place gets (line out the door, 45+ minute wait, etc.) and we were lucky to grab the last two-top at 8:15 with no wait at all. Blue Moon Cafe is an adorable little space that reminded me a lot of this place in Phoenix that I used to love called the Willow House (R.I.P). It was tucked between small local businesses and walk-up apartments of sorts and it had a very cozy, neighborhood atmosphere. Service was great, our table by the window was (in my opinion) the best in the house, and the food was top notch breakfast with a unique twist. They’re known for this crazy creation called the Cap ‘n Crunch French Toast, and YES, it’s unreal. Innovative, delicious, but very, very sweet. I would have been able to take this bad boy down had I not made the mistake of ordering a homemade caramel bun beforehand. Never order anything sweet when getting the French Toast. It WILL kill you. The dish was so sweet, that my plate of amazingly golden hash browns remained untouched. Next time, I’m coming equipped with a big ole’ side of bacon. A Lunch highlight of my trip was definitely making the short drive over from downtown Baltimore to Woodberry Kitchen. Located near Clipper Park, Woodberry Kitchen sits in a huge architectural complex that houses small studios, shops, and modern housing. A bit off the beaten path for the average tourist, Woodberry is exactly the kind of place I wished every city had. Rustic Americana decor in a giant re-purposed space. Exposed brick, industrial steel, and reclaimed wood give this place an earthy, pioneer-like feel; its giant cathedral-like windows bathing the space in daylight. Brunch during the weekends is a popular time for this place, so reservations are recommended. Luckily, they do use OpenTable so the process is rather easy. Service is super friendly and attentive and the atmosphere is comfortable and familiar. We sat up on the second floor over-looking the restaurant and I couldn’t have asked for a better start to the weekend. Mor ordered the cold spelt crepes which were incredibly fresh and creamy without being too heavy. I went the opposite route and ordered their country fried chicken which was rich and flavorful. Brined overnight and soaked in buttermilk, their organic, free-range chicken was juicy and tender and covered in a delicious savory batter. I would have preferred a crispier cutlet, but the flavors were so good, the slight sogginess didn’t matter. Served with wilted local chard, purple haze carrots, and a giblet gravy that could knock your socks off, this dish was hearty and about as country as you can get in these parts. 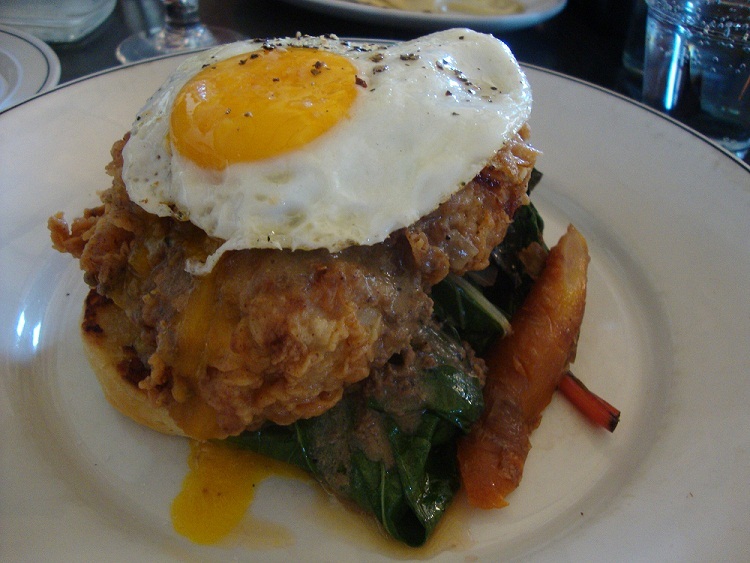 Did I mention that it was all topped with a runny fried egg?! If the basil ice cream is on the menu, make no mistake. It’ll probably be the best basil ice cream of your life…as part of their lemon curd basil ice cream tart…it’s just other-worldly. Last but not least, we hit up The Brewer’s Art for Dinner. I had heard so many amazing things from my craft beer friends about this place and after looking at the menu, I knew I needed to make it a dining priority. I’ve been a fan of their Resurrection Ale ever since I had it at my boyfriend’s sister’s house a couple of years ago, so it was a thrill to have the stuff freshly tapped. Brewer’s Art is located in a beautiful part of Baltimore called Mount Vernon. Walking down from our hotel, Mor and I agreed that this was the more quaint and better maintained part of the city; less gritty and rough around the edges with a more classic east coast feel. Brewer’s Art itself seems like a renovated museum space; a large, multi-room restaurant that had a kitschy living room feel with a touch of English Victorian class. This is one of the more popular places in town, so once again, OpenTable came to the rescue with an earlier dinner reservation. By the end of our meal, the house was packed. While my Ozzy-beer brined chicken was tasty and had a rich flavor, the star of my meal was definitely their pork belly appetizer. I DREAM of this pork belly appetizer…it’s that good. 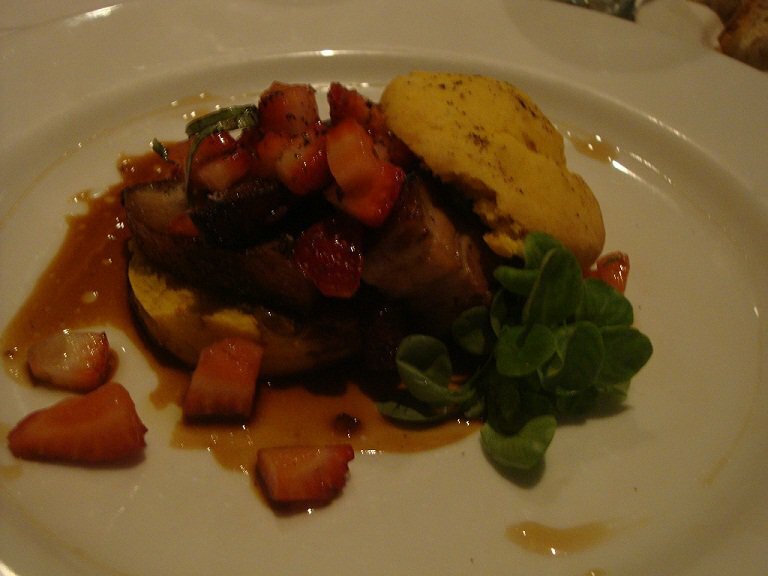 Tender char sui style pork belly served with a luscious sweet potato biscuit, fresh strawberries, and a balsamic reduction.